Audio Technica AT-HA5050H review | What Hi-Fi? We’ve been intrigued by this Audio Technica unit ever since we first laid eyes on it at the Munich High End show last year. Even among all the glamorous high-end kit, this compact box stood out. The AT-HA5050H looked out of its time, something that had escaped from some aged audiophile’s hidden stash of treasures, rather than something on the shelves now. 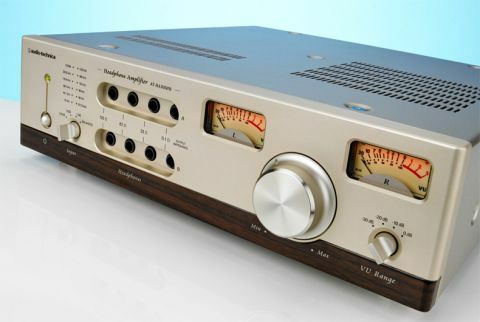 Look at it – all 70s retro styling, twin VU meters and eight headphone outputs. That’s right, eight. Why would anyone ever need eight? While it may not be obvious from appearances, this is a digital-to-analogue converter/headphone amp as distinct from the current fashion of having a DAC with a headphone output. The difference? The Audio Technica has analogue line level inputs in both single-ended and balanced flavours. The company has solely focused on headphone users here – you can’t connect this unit to an external amp, as there are no line level outputs. It turns out that Audio Technica don’t envisage all the 6.3mm jacks sockets being used at once, either. This isn’t some sort of comparison tool designed to drive all those headphones in one go. Users are limited to using just two (recommended impedance values of 16-600ohms), which should be enough for most. Each of these headphones can be connected to any one of four outputs; each having a different output impedance. Think of it as a way of fine-tuning the presentation to suit your tastes – the higher the output impedance, the mellower and more bass-heavy the sound. It appears an odd way of doing things, but it works. We found ourselves alternating between different settings on a regular basis, depending on the source material. Aggressive, less capable sources usually made us move towards one of the outputs with higher output impedance – usually 82ohms – while high-quality signal feeds had us settling on the 33ohm option. Going to the 0.1ohm option bought greater detail and attack, but lost too much in the way of natural warmth and bass weight for our tastes. As always, such things depend much on the headphones connected and personal taste. It’s just fun to play around. The AT-HA5050H’s build quality is excellent. It feels immensely solid and is superbly finished. We’re not great fans of the laminated rosewood strip on the lower edge of the front panel, but there’s no denying the crisp, luxury feel of all the controls. We love the smooth, damped movement of the volume dial, in particular. This has got to be the heaviest unit of this type we’ve come across. It weighs in at 11kg, which is about what a typical grand’s worth of amp comes in at. It’s large for a desktop unit too, with both a width and depth of 33cm. Take the lid off and you’ll find the insides packed with quality components. It uses a hybrid audio circuit with a pair of E88CC valves in the preamp section driving Toshiba bipolar power transistors in the output stage. We’re impressed by the generously specified power supply that looks easily beefy enough to work a full-size power amp. The DAC section is enclosed in a fully shielded case to minimise interference and reduce noise levels. Cleverly, Audio Technica also uses this case to protect the audio circuitry from any interference from the custom R-core mains transformer. Look around the back and you’ll find USB type B and coax digital inputs. There’s no optical option here, which is a shame. The USB input can be switched between asynchronous and adaptive modes, which helps with compatibility. We opted for the asynchronous option for most of the test on performance grounds. The 5050 can cope with pretty much any signal you care to throw at it. It’ll cope with 32-bit/384kHz PCM files (if you can find any worth listening to), right through to double speed DSD (ditto). One thing to note is that it will only handle DSD with the USB input switched to asynchronous mode. In adaptive mode the maximum sampling rate is held at 192kHz with no option of DSD replay. Once up and running this is a wonderfully entertaining performer, though it takes a while to appreciate its brilliant refinement and total lack of hard edges. The AT-HA5050H isn’t the kind of product that grabs your attention from the off – the presentation is far too understated for that. The detail is all there but it isn’t thrown at the listener in a bid to impress. No, this unit prefers to persuade the listener with a wonderfully-layered sound that lacks little in terms of insight or finesse. We listen to Beethoven’s Moonlight Sonata and are entranced. The 5050 sounds wonderfully organic, with dynamics moving fluidly from quiet to loud in clean sweeps. The lead edges of notes are defined with precision and are as crisp as you like, but never sound hard-edged or forced. The 5050 doesn’t have to highlight its high level of resolution in that way. We’re impressed by the tonality too. It’s just a touch on the sweet side, and possessing of body and natural warmth, but still balanced enough to convince. Such a presentation works wonderfully with less than perfect recordings, rounded off the rough edges just enough to keep things listenable. But don’t get the wrong idea. This unit isn’t some big softy that makes everything sound nice, as a spin of Kanye West’s Yeezus shows. Here, there’s plenty of punch and attack. Rhythmically it isn’t quite as crisp as Chord’s Hugo TT, but the Audio Technica can still convey the momentum of the music well. More than that, it captures the anger and aggression of the album superbly, rendering West’s vocals with all the grit they deserve. Bass frequencies are lovely – rich and articulate – while highs have sparkle, bite and refinement in equal measures. This box is equally adept through its line level inputs. Normally such inputs tend to be an afterthought on predominately digital products, but not here. The line stage is a good one, and given a talented source fully capable of delivering a performance every bit as engaging as that of the built-in DAC. If you’re a headphone obsessive we can’t think of a better high-end alternative. Chord’s Hugo TT offers a more dramatic sound with greater impact, but the Audio Technica’s organic, full-bodied approach is just as convincing, and arguably a better long-term choice thanks to its unfussy nature. We also love the retro feel of this product and the aura of quality it oozes from every control. And let’s not forget the enduring appeal of a VU meter. Tempted? We are indeed.